Learning a new language? Want to practice your language skills? Preparing to travel abroad? Portland Public Library has online tools, audiobooks, and books to help you learn a language, at any skill level, at your own pace. Voulez vous apprendre une nouvelle langue, à votre propre rythme? Aprendiendo un nuevo idioma, a su proprio ritmo? Aprendendo uma nova língua, no seu próprio ritmo? 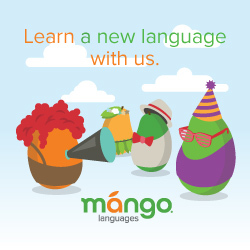 Mango Languages is a fun, fast online system to learn 45 languages including Arabic, Spanish, French, Japanese, Portuguese, German, Mandarin Chinese, Italian, Russian, Swahili … and many more. Mango is a practical, interactive program, focused on conversation skills, so you’ll start speaking after just one lesson. Try this new Mango product — the first and only language and culture learning system that teaches through feature films now available from Portland Public Library. Use Mango on a computer or download the iPhone or Android app. Set up your free account with your email address, library barcode, and a password. Pronunciator offers self-paced language learning for 80 languages and ESL for 50 non-English languages. Features include audio lessons, interactive textbooks, intelligent flashcards, pronunciation analysis, phrasebooks, and quizzes. If you select any of the ESL courses in Pronunciator, you will have the option of following the ProCitizen course for help with the American citizenship test. ProCitizen involves short videos and interactive quizzes to help you remember what you need to know to prepare for the naturalization test. For added convenience, download a mobile app and learn a new language wherever you go! Pronunciator’s HTML5-based app works in all Apple, Android, and Kindle Fire devices. Before using the app, you need to register via the library’s Pronunciator link and obtain a “Student name” (aka user name) and “Password.” With these credentials, you can log into any of the apps and progress will automatically be synced across all of your devices. Download eBooks and eAudiobooks for learning a variety of languages from cloudLibrary. Search for “language” or click “Foreign Language Study” in the cloudLibrary menu to see the full collection. Tumblebooks also offers some children’s language learning eAudiobooks in French, Spanish, Chinese, and Russian. Check out our collection of adult fiction & nonfiction in non-English languages.